The Baltimore Sun is the largest general-circulation daily newspaper based in the American state of Maryland and provides coverage of local and regional news, events, issues, people, and industries. Founded in 1837, the newspaper is owned by Tribune Publishing. The Sun was founded on May 17, 1837, by printer/editor/publisher/owner Arunah Shepherdson Abell (often listed as "A.S. Abell") and two associates, William Moseley Swain, and Azariah H. Simmons, recently from Philadelphia, where they had started and published the Public Ledger the year before. Abell was born in Rhode Island, where he began journalism with the Providence Patriot and later worked with Newspapers in New York City and Boston. The Abell family and descendents owned The Sun (later after 1910 colloquially known in Baltimore as The Sunpapers (for the senior morning paper and the added afternoon daily The Evening Sun) until that same year of 1910, when the local Black and Garrett families of wealthy financial means invested funds in the paper under the suggestion of former rival owner/publisher of The News, Charles H. Grasty, and they, along with Grasty gained a controlling interest; they retained the name A. S. Abell Company for the parent publishing company. That same year, an additional daily publication was established called The Evening Sun under the guidance of former reporter, editor/columnist Henry Louis Mencken (nationally famous as "H.L. Mencken") (1880-1956), From 1947 to 1986, The Sun was the owner of Maryland's first television station, WMAR-TV (Channel 2), founded 1947 and longtime affiliate of the Columbia Broadcasting System (CBS television network, along with several radio stations. In the postwar years, The Sun significantly expanded its overseas presence. The newspaper opened its first foreign bureau in London in 1924. Between 1955 and 1961, it added four new foreign offices. As Cold War tensions grew, it set up shop in Bonn, West Germany, in February 1955. (The bureau later moved to Berlin.) Eleven months later, The Sun opened a Moscow bureau, becoming one of the first U.S. newspapers to do so. A Rome office followed in July 1957, and in 1961, The Sun expanded to New Delhi. At its height, The Sun' ran eight foreign bureaus, giving rise to its boast in a 1983 advertisement that "The Sun never sets on the world." The paper was sold under recent non-family publisher Reg Murphy in 1986 to the Times-Mirror Company of the Los Angeles Times. The same week, the 115 year old rivalry with The News American, came to an end, as that ancient old paper with publishing antecedents since 1773, with subsequent mergers, announced that it would fold. The oldest paper in the city, it had been owned by William Randolph Hearst and later his Hearst Corporation since the 1920s. A decade later in 1997, The Sun acquired the Patuxent Publishing Company, a local suburban newspaper publisher that had a stable of 15 weekly papers and a few magazines in several communities and counties. In the 1990s and 2000s, The Sun began cutting back its foreign coverage. In 1995 and 1996, closed its Tokyo, Mexico City and Berlin bureaus. Two more – Beijing and London – fell victim to cost-cutting in 2005. The final three foreign bureaus – Moscow, Jerusalem, and Johannesburg, South Africa – fell a couple years later. All were closed by 2008, as the Tribune Co. streamlined and downsized the newspaper chain's foreign reporting. Some material from The Sun's foreign correspondents is archived at the University of Maryland, Baltimore County. In the 21st century, The Sun, like most legacy newspapers in the United States, has suffered a number of setbacks in the competition with Internet and other sources, including a decline in readership and ads, a shrinking newsroom staff, and competition in 2005 from a new free daily, The Baltimore Examiner that lasted two years to 2007, along with a similar Washington publication of a small chain recently started by new owners that took over the old Hearst flagship paper, the San Francisco Examiner. In 2000, the Times-Mirror company was purchased by the Tribune Company of Chicago. I, 2014 it transferred its newspapers, including The Sun, to Tribune Publishing. 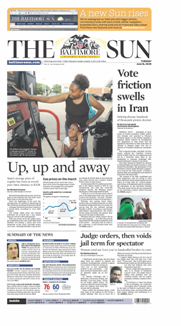 On September 19, 2005, and again on August 24, 2008, The Baltimore Sun as the paper now titled itself, introduced new layout designs. Its circulation as of 2010[update] was 195,561 for the daily edition and 343,552 on Sundays. On April 29, 2009, the Tribune Company announced that it would lay off 61 of the 205 staff members in the Sun newsroom. On September 23, 2011, it was reported that the Baltimore Sun would be moving its web edition behind a paywall starting October 10, 2011. On February 20, 2014, The Baltimore Sun Media Group announced that they would buy the alternative weekly City Paper. In April, the Sun acquired the Maryland publications of Landmark Media Enterprises. Although there is now only a morning edition, for many years there were two distinct newspapers—The Sun in the morning and The Evening Sun in the afternoon— each with its own separate reporting and editorial staff. The Evening Sun was first published in 1910 under the leadership of Charles H. Grasty, former owner of the Evening News, and a firm believer in the evening circulation. For most of its existence, The Evening Sun led its morning sibling in circulation. In 1959, the afternoon edition's circulation was 220,174, compared to 196,675 for the morning edition. However, by the 1980s, cultural, technological and economic shifts in America were eating away at afternoon newspapers' market share, with readers flocking to either morning papers or switching to nightly television news broadcasts. In 1992, the afternoon paper's circulation was 133,800. By mid-1995, The Evening Sun's readership — 86,360 — had been eclipsed by The Sun — 264,583. The Evening Sun ceased publication on September 15, 1995. After a period of roughly a year during which the paper's owners sometimes printed a two-section product, The Baltimore Sun now has three sections every weekday: News, Sports and alternating various business and features sections. On some days, comics and such features as the horoscope and TV listings are printed in the back of the Sports section. After dropping the standalone business section in 2009, The Sun brought back a business section on Tuesdays and Sundays in 2010, with business pages occupying part of the news section on other days. Features sections debuting in 2010 included a Saturday "Home" section, a Thursday "Style" section and a Monday section called "Sunrise." The sports article written by Peter Schmuck is published only on week-days. The Sunday Sun for many years was noted for a locally produced rotogravure Maryland pictorial magazine section, featuring works by such acclaimed photographers as A. Aubrey Bodine. The Sunday Sun dropped the Sunday Sun Magazine in 1996 and now only carries Parade magazine on a weekly basis. A quarterly version of the Sun Magazine was resurrected in September 2010, with stories that included a comparison of young local doctors, an interview with actress Julie Bowen and a feature on the homes of a former Baltimore anchorwoman. Newsroom managers plan to add online content on a more frequent basis. The company introduced its Web site in September 1996. A redesign of the site was unveiled in June 2009, capping a six-month period of record online traffic. Each month from January through June, an average of 3.5 million unique visitors combined to view 36.6 million Web pages. Sun reporters and editors produce more than three dozen blogs on such subjects as technology, weather, education, politics, Baltimore crime, real estate, gardening, pets and parenting. Among the most popular are Dining@Large, which covers local restaurants; The Schmuck Stops Here, a Baltimore-centric sports blog written by Peter Schmuck; Z on TV, by media critic David Zurawik; and Midnight Sun, a nightlife blog. A Baltimore Sun iPhone app was released September 14, 2010. The Baltimore Sun has been home to some of the best American writers, including reporter, essayist, and language scholar H.L. Mencken, who enjoyed a forty-plus-year association with the paper. Other notable journalists, editors, photographers and cartoonists on the staff of Sun papers include Rafael Alvarez, Richard Ben Cramer, Russell Baker, A. Aubrey Bodine, John Carroll, James Grant, Turner Catledge, Edmund Duffy, Thomas Edsall, John Filo, Jon Franklin, Jack Germond, Mauritz A. Hallgren, Price Day, Phil Potter, David Hobby, Brit Hume, Gwen Ifill, Gerald W. Johnson, Kevin P. Kallaugher (KAL), Murray Kempton, Frank Kent, Tim Kurkjian, Laura Lippman, William Manchester, Lee McCardell, sportscaster Jim McKay, Kay Mills, Robert Mottar, Reg Murphy, Thomas O'Neill, Drew Pearson, Ken Rosenthal, Louis Rukeyser, Dan Shaughnessy, David Simon, Michael Sragow, John Steadman, Jules Witcover, and William F. Zorzi. The paper has won 15 Pulitzer Prizes. The first issue of The Sun, a four-page tabloid, was printed at 21 Light Street in downtown Baltimore in the mid-1830s. A five-story structure, at the corner of Baltimore and South streets, was built in 1851. The "Iron Building", as it was called, was destroyed in the Great Baltimore Fire of 1904. In April 1988, at a cost of $180 million, the company purchased 60 acres (24 ha) of land at Port Covington and built "Sun Park". The new building houses a satellite printing and packaging facility, as well as the distribution operation. The Sun's printing facility at Sun Park has highly sophisticated computerized presses and automated insertion equipment in the packaging area. To keep pace with the speed of the presses and Automated Guided Vehicles; "intelligent" electronic forklifts deliver the newsprint to the presses. In 1885, The Sun constructed a building for its Washington Bureau at 1317 F Street, NW. The building is on the National Register. The paper became embroiled in a controversy involving the former governor of Maryland, Robert L. Ehrlich Jr. (R). Ehrlich had issued an executive order on November 18, 2004, banning state executive branch employees from talking to Sun columnist Michael Olesker and reporter David Nitkin, claiming that their coverage had been unfair to the administration. This led The Sun to file a First Amendment lawsuit against the Ehrlich administration. The case was dismissed by a U.S. District Court judge, and The Sun appealed to the 4th U.S. Circuit Court of Appeals, which upheld the dismissal. The same Olesker was forced to resign on January 4, 2006, after being accused of plagiarism. The Baltimore City Paper reported that several of his columns contained sentences or paragraphs that were extremely similar (although not identical) to material previously published in The Washington Post, The New York Times, and The Sun. Several of his colleagues both in and out of the paper were highly critical of the forced resignation, taking the view that the use of previously published boilerplate material was common newsroom practice, and Olesker's alleged plagiarism was in line with that practice. Between 2006 and 2007, Thomas Andrews Drake, a former National Security Agency executive, allegedly leaked classified information to Siobhan Gorman, then a national security reporter for The Sun. Drake was charged in April 2010 with 10 felony counts in relation to the leaks. In June 2011, all 10 original charges were dropped, in what was widely viewed as an acknowledgement that the government had no valid case against the whistleblower, who eventually pleaded to one misdemeanor count for exceeding authorized use of a computer. Drake was the 2011 recipient of the Ridenhour Prize for Truth-Telling. The Baltimore Sun was featured in the American crime drama television series The Wire in 2008 (season 5), which was created by former Sun reporter David Simon. Like all of the institutions featured in The Wire, the Sun is portrayed as having many deeply dysfunctional qualities while also having very dedicated people on its staff. The season focuses on the role of the media in affecting political decisions in City Hall and the priorities of the Baltimore Police Department. Additionally, the show explores the business pressures of modern media through layoffs and buyouts occurring at the Sun, on the orders of the Tribune Company, the Sun's corporate owner. One storyline involves a troubled Sun reporter named Scott Templeton, and his escalating tendency to sensationalize and falsify stories. The Wire portrays the managing editors of the Sun as turning a blind eye to the protests of a concerned line editor, in the managing ediors' zeal to win a Pulitzer Prize. The show insinuates that the motivation for this institutional dysfunction is the business pressures of modern media, and working for a flagship newspaper in a major media market like The New York Times or The Washington Post is seen as the only way to avoid the cutbacks occurring at the Sun. Season 5 was The Wire's last. The finale episode, "-30-", features a montage at the end portraying the ultimate fate of the major characters. It shows Templeton at Columbia University with the senior editors of the fictional Sun, accepting the Pulitzer Prize, with no mention being made as to the aftermath of Templeton's career. ^ Sherman, Natalie (March 2, 2016). "Baltimore Sun editor Trif Alatzas named publisher amid Tribune shake-up". The Baltimore Sun. Archived from the original on March 2, 2016. Retrieved March 24, 2017. ^ "The Baltimore Sun". baltimoresunmediagroup.com. Archived from the original on October 20, 2016. Retrieved March 24, 2017 – via The Baltimore Sun Media Group. ^ "Bluesheets: (Baltimore) The Sun". Thomson Reuters. September 1, 2005. Archived from the original on July 10, 2011. Retrieved May 28, 2008. ^ "The Baltimore Sun opens bureau in India". The Baltimore Sun. January 17, 1961. Retrieved March 31, 2017. ^ a b Madigan, Nick (October 7, 2005). "Sun cuts foreign bureaus from 5 to 3". The Baltimore Sun. Retrieved March 31, 2017. ^ Walsh, Sharon Warren; R, Eleanor; olph; Ifill, Washington Post Staff Writers; Staff writers Gwen; repo, Steve Luxenberg also contributed to this (May 29, 1986). "Baltimore Sun Papers Sold to Times Mirror Co". Washington Post. ISSN 0190-8286. Retrieved June 10, 2018. ^ Madigan, Nick (July 6, 2006). "Tribune Co. is closing Sun's foreign bureaus". The Baltimore Sun. Retrieved March 31, 2017. ^ "TRIBUNE CO. ANNOUNCES PLANS TO LAYOFF [sic] 27 PERCENT OF THE BALTIMORE SUN'S NEWSROOM STAFF, INCLUDING FOUR COLUMNISTS". Poynter. May 30, 2009. Archived from the original on May 14, 2009. Retrieved May 30, 2009. ^ Shin, Annys (October 18, 2007). "Examiner Plans Baltimore Edition". The Washington Post. Retrieved June 25, 2007. ^ Charles Apple (August 24, 2008). "Live pages from the Baltimore Sun's redesign". visualeditors.com. Archived from the original on September 13, 2008. Retrieved October 22, 2008. ^ Romenesko, Jim. "Updated: Baltimore Sun to put up paywall next month | Poynter". Poynter. Archived from the original on November 12, 2011. Retrieved February 20, 2014. ^ "Baltimore Sun Media Group to buy City Paper". The Baltimore Sun. Retrieved February 20, 2014. ^ Marbella, Jean. "Baltimore Sun Media Group buys The Capital in Annapolis and the Carroll County Times". ^ a b "As the end draws closer for The Evening Sun..." The Baltimore Sun. June 26, 1995. Retrieved March 31, 2017. ^ Jones, Tim (July 14, 1999). "Sun Setting On Another Afternoon Newspaper". Chicago Tribune. Retrieved March 31, 2017. ^ Imhoff, Ernest (June 20, 1993). "They Hate To See That Ev'nin' Sun Go Down". The (Baltimore) Evening Sun. Retrieved March 31, 2017. ^ "Baltimore Sun – The No. 31 Newspaper in the USA". Mondo Code. Archived from the original on October 10, 2008. Retrieved May 28, 2008. ^ "Entertainment - Baltimore Sun". www.thesunmag.com. ^ Dance, Scott (August 12, 2015). "Free weekly b to cease publication Aug. 27". The Baltimore Sun. Baltimore Sun Media Group. Retrieved October 16, 2017. ^ "About The Baltimore Sun". The Baltimore Sun. Retrieved May 28, 2008. ^ "Sun Columnist Dismissed; Attribution Issues Cited". The Washington Post. January 5, 2006. Retrieved September 14, 2010. ^ "On Background". Baltimore City Paper. January 18, 2006. Archived from the original on August 14, 2011. Retrieved September 14, 2010. ^ "Ex-NSA worker from Md. charged in classified leak case". The Baltimore Sun. April 15, 2010. Retrieved September 14, 2010. ^ Steiner, Linda; Guo, Jing; McCaffrey, Raymond; Hills, Paul (August 2012). "The Wire and repair of the journalistic paradigm". Journalism. 14 (6): 703–720. doi:10.1177/1464884912455901. Rasmussen, Frederick N. "Sun vignette has been greeting readers since 1837," The Baltimore Sun, Monday, May 17, 2010. "Control of Baltimore Sun. Charles H. Grasty Becomes Executive Head of the Paper" (PDF). NY Times. January 27, 1910. "Sun circulation on Sunday reaches over 340,000".